Earnings season is set to begin today. Are you ready? 1. Earnings: Alcoa unofficially kicks off the U.S. corporate earnings season on Monday after the markets close. Later in the week, we'll hear from major banks like JP Morgan Chase (JPM) and Bank of America (BAC), alongside American carrier Delta Air Lines (DAL). 2. On the radar -- Yahoo, Tesla: Investors continue to monitor Yahoo (YHOO) after the parent company behind the British newspaper, The Daily Mail, confirmed it's considering a bid for the struggling Internet giant. Shares in Yahoo are edging up in premarket trading. Verizon (VZ) and Google (GOOG) have also reportedly been considering bids for the company. Both declined to comment about the matter last week. And Tesla (TSLA) shares are also being watched closely as the company holds a conference call at 12 p.m. ET to discuss "an update" from the firm. The company recently unveiled a new vehicle called the Model 3. Shares in the electric car manufacturer have rallied by just over 20% in the last month. 3. 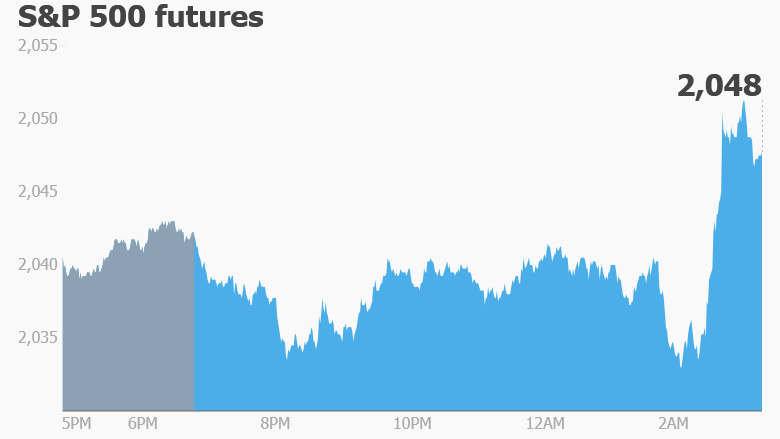 Global market overview: U.S. stock futures are holding steady ahead of the open. European markets are mostly in positive territory in early trading. Asian markets ended the day with mixed results. Oil prices are slipping a tad to trade around $39.50 per barrel. The price of gold is edging up to trade just above $1,250 per ounce.